Here’s something you don’t see everyday. Michael Perez of Extreme Fighter Magazine interviewing Jay White. Xtreme Couture’s Jay White went Hollywood last weekend. Jay will be appearing alongside Quinton “Rampage” Jackson in an upcoming Nike commercial. The details of the commercial titled “Human Chain” are unknown to us at this time. But we’re told it will feature MMA training and/or fighting. So look for Jay as you’re channel surfing, and expect to see him back in the cage this Spring. For more on the commercial shoot and to see what Rampage is driving check out Throwdown.com. Xtreme Couture fighters went 4-0 last week. John Alessio got the ball rolling Wednesday in the WEC by defeating Todd Moore. Mark Hominick beat Danny Martinez Friday night in the TKO promotion. Saturday in Dallas on HDNet Fights Jay White beat Patrick Castillo by arm bar and Frank Trigg submitted Edwin Dewees. There are no Xtreme Couture fights this weekend. But December 28th at the Riviera Hotel here in Vegas Eleana “Baby Doll” Reid makes her MMA debut and Dennis Davis returns to the cage in the IFO. And December 29th Jay Hieron and Chris Horodecki compete for titles in the IFL and our good friend Wanderlei Silva takes on Chuck Liddell in the UFC. 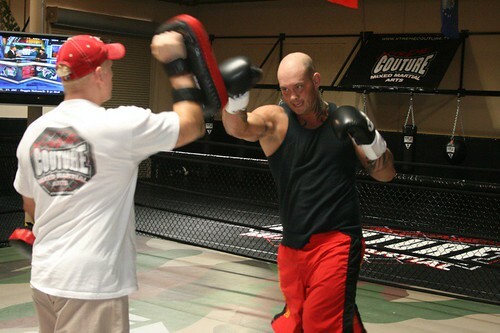 Xtreme Couture’s Frank Trigg and Jay White will be featured on tonight’s HDNet Fights’ “Reckless Abandon”. Trigg headlines the show. He’ll be taking on Edwin Dewees. While Jay White steps in the cage with Patrick Castillo. The fights air at 8pm ET/5pm PT only on HDNet. Heavyweight Jay White returns to the cage on Saturday December 15th at the American Airlines Arena in Dallas on the HDNet Fights show. He’ll be taking on Patrick Castillo. Jay is chomping at the bit to get back in the cage. His last fight was on St Patrick’s Day in 2006. Jay came down from Oregon to train with Randy for 2 weeks before the Gonzaga fight and ended up staying. He spent his summer serving as a stand-in for Gabriel Gonzaga and rolling with The Natural everyday. 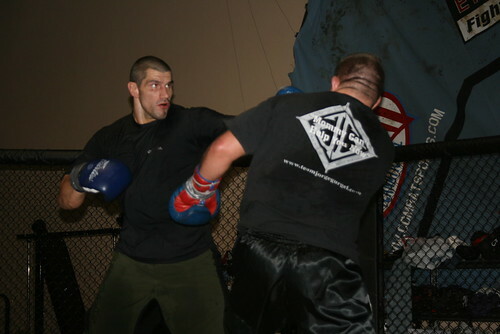 He also helped Phil Friedman get ready for his pro debut and trained with James “Colossus” Thompson, Forrest Griffin and Kimbo. 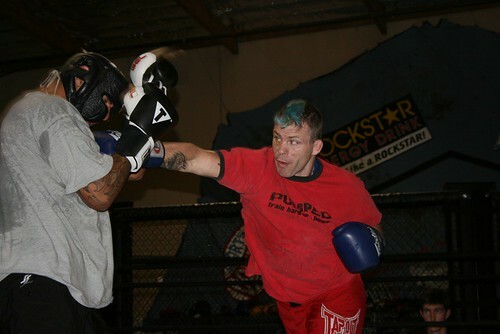 Now that he is settled in with a good, positive team situation he’s ready to make his mark on the HDNet Fights show. The Xtreme Couture gym is buzzing with fighters gearing up for high profile fights. Jay Hieron and Chris Horodecki are gearing up for the IFL Grand Prix. Jay fights Pat Healy and Chris has a heavily anticipated rematch with Bart Palaszewski. 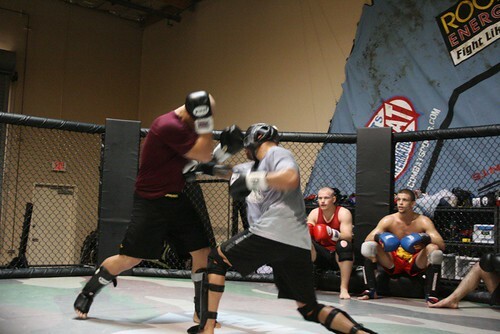 Mike Pyle is getting set for Jake Shields in Elite XC on Nov 10th. Karo Parisyan is readying for a replacement for Hector Lombard. Karo is slated to fight at UFC 78 in New Jersey Nov 17th. Stephan Bonnar is also in the gym, he faces Eric Schafer at UFC 76 in Cincinatti on Oct 20th. Josh Haynes just left for Stockton, CA where he fights Steve Heath this Saturday. Jay White is prepping for his comeback to the cage on Nov 3rd against Corey Salter in Austin, TX. 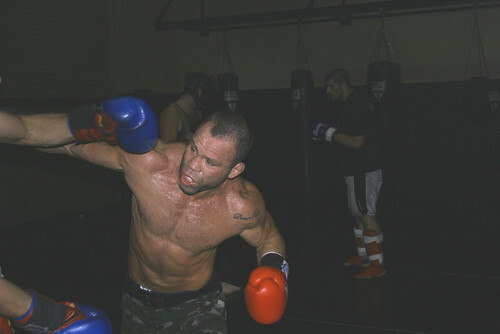 Wanderlei is going to fight someone on December 29th in Vegas. Though rumors are flying, we can’t say who yet. The Xtreme Couture Team went 11-0 in the month of September. We’re hoping through hard work and dedication to keep the momentum going through October and November.